Do you want to be part of Acquire? ALL AUDITION SLOTS ARE NOW FULL. PLEASE EMAIL JIMI@ACQUIRE.org.uk IF YOU WOULD LIKE TO BE PUT ON OUR WAITING LIST. 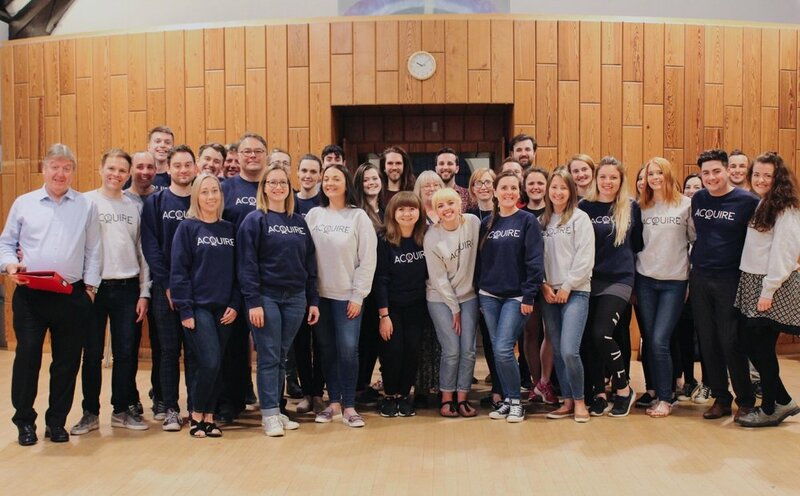 Acquire is a creative choral ensemble based in Glasgow. Whilst we are lucky to live in a city with such a rich and diverse musical theatre scene, sometimes life gets in the way. Be it going to yet another wedding, managing a class of thirty children five days a week or finding the time to see your Great Aunt Belinda (all the while trying to finish the latest series on Netflix), it can be hard to get your musical fix. We mainly focus on musical theatre and acting through song, aiming to perfect harmony, expand vocal ability and explore the meaning of a song. We really enjoy what we do, and we're all about creating a positive singing environment in which people can learn and grow as performers. Please follow us across our social media to keep up with all of our latest news. Acquire is all about creating a positive singing environment where you can learn and grow as a performer. Membership: Membership is £10 per month. At this time we are only able to accept members over the age of 18. Graham has around ten years' experience as a theatre director, musical director, conductor and composer. Although he would never admit to being a singer himself, he is interested in vocal technique, choral harmony and acting through song. He is interested in the construction of songs and musicals. Graham is a full time primary school teacher and currently has a new musical in development. Paul is a software developer and mathematician with extensive experience as a keys and woodwind player in the Glasgow musical theatre scene, having performed in over 30 shows and concerts. Ben has been a mainstay of the Glasgow musical theatre scene for a number of years. He currently works as a software developer and is an integral part of the Acquire team with his webmaster skills. Ami has been a committed member of the Glasgow musical theatre scene for the past eight years. Graduating in English teaching, she is dedicated to inspiring a love and appreciation of the arts in a younger generation. After many years performing in Aberdeen, Kirsty moved to Edinburgh and gained her HNC Musical Theatre, specialising in voice studies and conducting. Kirsty performs at weddings and corporate events, accompanied by her pianist husband Andrew; she also sings Soprano 2 with Glasgow University’s Madrigirls. Robert graduated in 2016 from the University of Glasgow where he studied accountancy. Although not a performer himself, he has always been hugely supportive of the arts and is pleased that he can apply his accountancy skills to a new group such as Acquire. Kit works as a development engineer having studied Electronics with Music at the University of Glasgow. He has supported many Glasgow theatre groups with their technological needs and is keen to bring his unique skillset to Acquire. Laura is extremely passionate about singing and musical theatre. Having been a keen performer for many years she is now a Youth Arts Worker for Render Glasgow where she specialises in delivering arts activities for young people and manages Acquire’s various social media. We are honoured to work with our generous patron whose support is invaluable. If you would like to become a patron of Acquire please get in touch with our secretary by emailing jimi@acquire.org.uk. Rob is currently the Head of Musical Theatre at the Urdang Academy and was formally the Head of Singing & Music at LAMDA in London, following his role as Head of Singing at Mountview Academy of Theatre Arts, London. He is a Fellow of the Higher Education Academy and is also a qualified Massage Therapist. Les Miserables, Batboy, Ragtime, Grease, Riverdance, Jerry Springer - the Opera, Carousel, Ragtime, The Wild Party, Moon Landing, Grab Me A Gondola, Dude! Where's My Teddy Bear? As Musical Director his credits include: Oliver! Grease, Little Shop of Horrors, The Drowsy Chaperone, The Secret Garden, Parade, Sweeney Todd and most recently, MD/Arranger for Linzi Hateley - True Colours. Rob also regularly coaches professional performers/productions around the UK. Recent credits include: Soul Sister (Savoy Theatre) and Loserville (Garrick Theatre) and the Glee Club Challenge (Indigo 02). As a composer his credits include: The Laramie Project, The Temperamentals and his debut album 'Scrapbook' with fellow composer Verity Quade, featuring many West End performers. He co-wrote the song 'Confidence is Consciencless', to be featured in the forthcoming Sky TV documentary 'Life Is Beauty-Full'. If you don't hear back from us within a few days, please check your email's junk or spam folder.